The Grand Budapest Hotel tells of the adventures of concierge Gustave H and his lobby boy as they work together to prove the innocence of Gustave H after he is framed for murder. Three siblings were child prodigies but experienced failure and disappointment when their father left them when they were young. Now the Tenenbaum family reunites when the father announces that he is has a terminal illness. 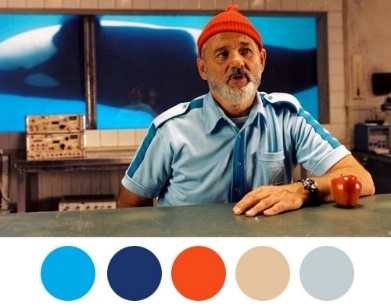 Steve Zissou is a quirky oceanographer with a plan to get revenge on the ‘Jaguar shark’ that killed his partner. Zissou goes on an adventure with his estranged wife, a journalist, and a manwho might be his son. I looked at that book, The Wes Anderson Collection, and it looked awesome….should have bought it then, but will probably do that later…. LOVED reading your top 5 favorites by Wes! The color palettes were a nice touch and very true. Great post, really brilliant and fun to read.